The Nystrom fire-rated Upward Opening Access Door is designed for those special ceiling applications when the door must swing upward into the ceiling cavity. 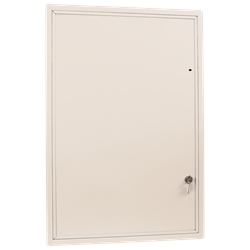 IU - Sizes ≤24" x 36"
Rough opening is door size + 1/4 inch. Use IU for access doors 24 inches by 36 inches or smaller; FRU for larger doors.